If he is to stand any change of winning his wager he will need to call upon the talents of a crack drill Sergeant. Enter Bill Barrett, Flight Sergeant extraordinaire, who has made a name for himself by training a Flight of raw female WRAF recruits, calling themselves the BlueBelles, to outperform a Flight of their male counterparts in a drill competition at RAF Chatworth. Now promoted to Warrant Officer and posted to RAF March, Bill finds himself called upon to save the face of the Air Chief Marshal. But it is over two years since the original BlueBelles Drill Team was formed and its former members are now dispersed throughout the RAF or have left the service. 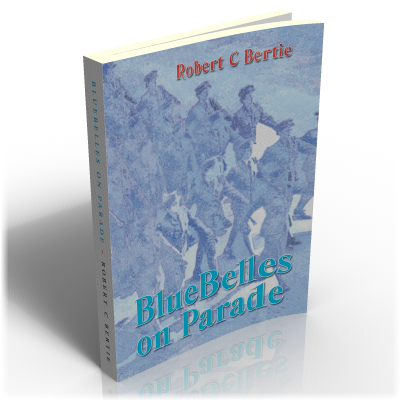 Bill faces the onerous task of producing a brand-new team of BlueBelles to pull off what is thought to be an impossible task. All kinds of mayhem ensue, in this light-hearted military comedy, which is sure to appeal to any former serviceman or woman.